UCLA geochemists and cosmochemists explore chemical processes at scales ranging from atoms, molecules and unit cells to plate boundaries, mountain belts, whole planets, and the solar system. We seek to understand the origin of our solar system, including its connection with the interstellar medium, the processes that transformed the cloud of dust and gas surrounding the nascent sun into the building blocks of planets, the geologic processes on those early planetesimals, and their accretion to form Earth and planets. We also examine rates of geologic processes, physical chemistry of fluids in extreme environments, how magma chambers form and evolve, the mineral transformations attending mountain building. The work is performed using an array of instrumentation, including the national ion microprobe facility, gas- and solid-source mass spectrometers, and a multiple-collector inductively coupled plasma mass spectrometer for precise measurements of isotopic compositions of natural materials. Experimental petrology facilities allow the synthesis and equilibration of minerals and fluids at pressure and temperature conditions from the Earth's surface to its core-mantle boundary, and include high-temperature furnaces, low, moderate, and high-pressure piston-cylinder devices, and the diamond-anvil cell. Computational facilities are available for first-principles studies of molecules and minerals, including the Beowulf-type linux clusters. 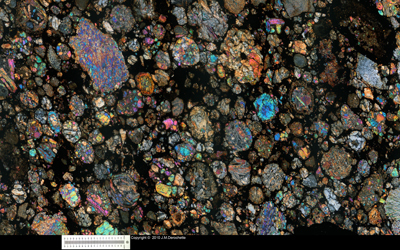 Other petrologic and geochemical facilities include an electron microprobe, an environmental scanning electron microscope, and Raman spectrometers.